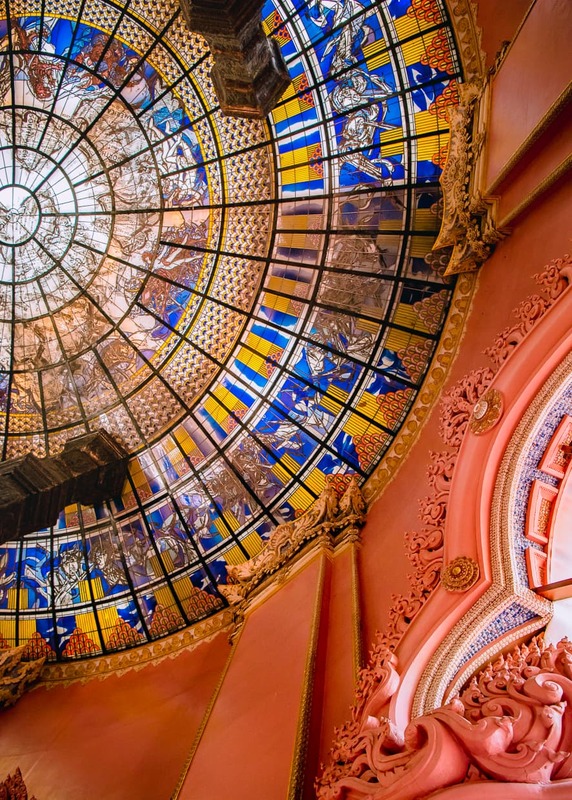 I think the Erawan Museum is one of the most beautiful attractions in Bangkok, Thailand. That’s saying something too, since it’s up against stiff competition from the Grand Palace, Wat Pho, Wat Arun, and a whole lot more. 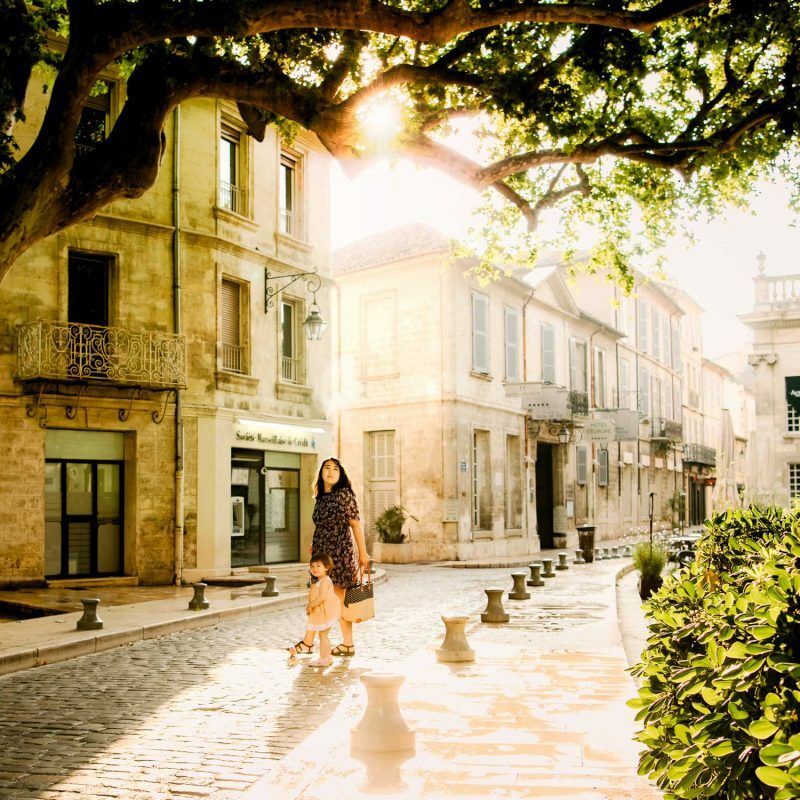 Despite that, it’s terribly underrated, and too often overlooked by travelers. 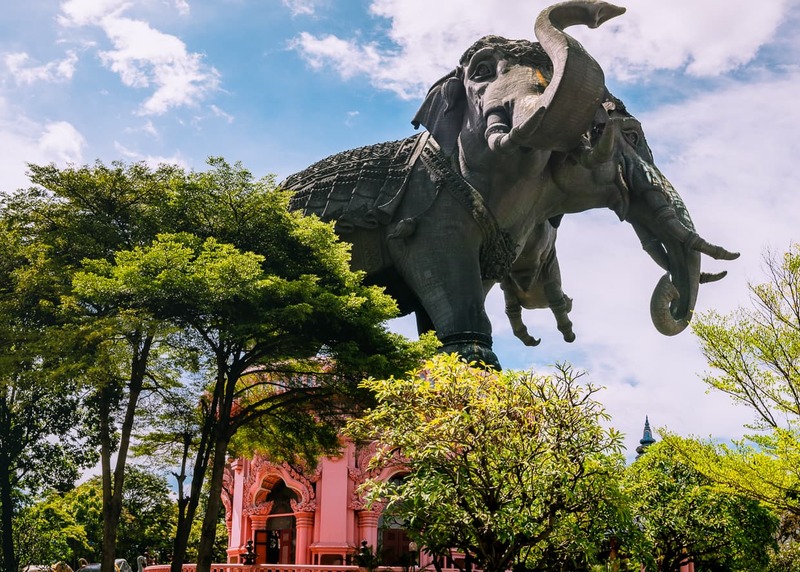 Here’s our guide to the Erawan Museum – have a look and see if it doesn’t find its way onto your Bangkok itinerary. 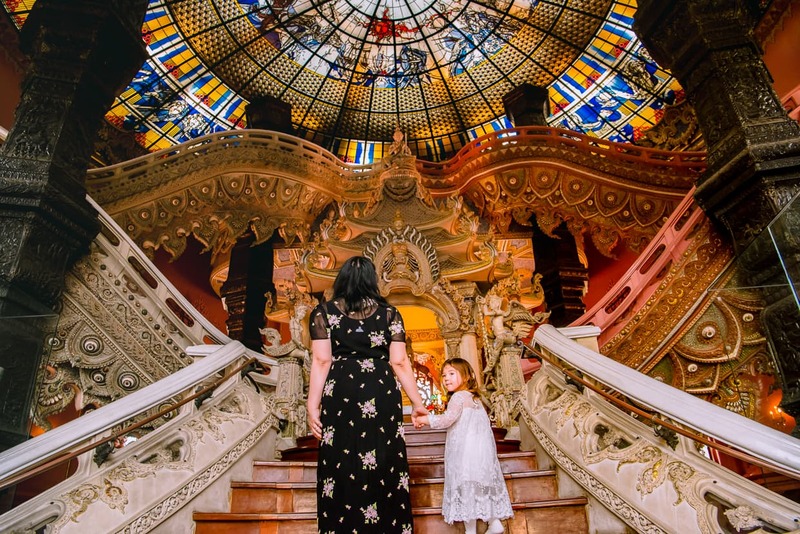 One of the best things about the Erawan Museum is that it is unique, not just to the city, but to the world. I feel comfortable saying that there is nothing else like it. 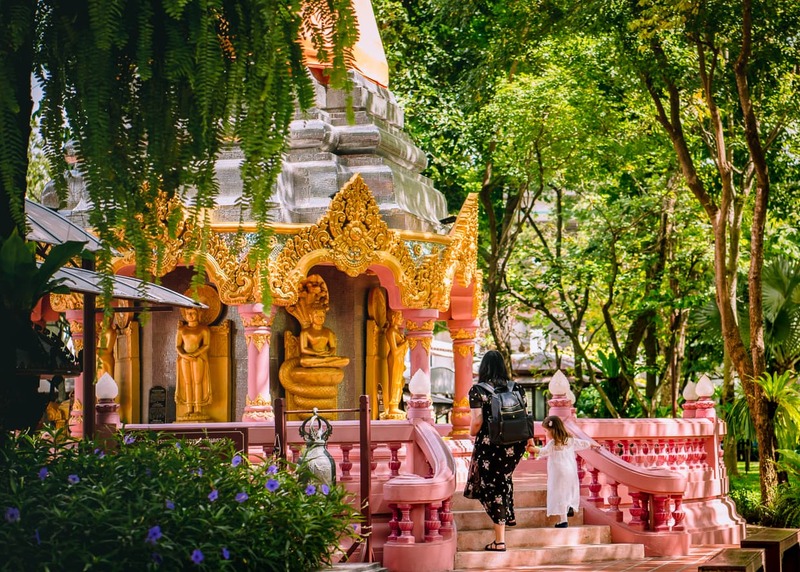 Many visitors to Thailand go touring and complain about “temple fatigue,” due to the similarity of many of the wats that they explore. 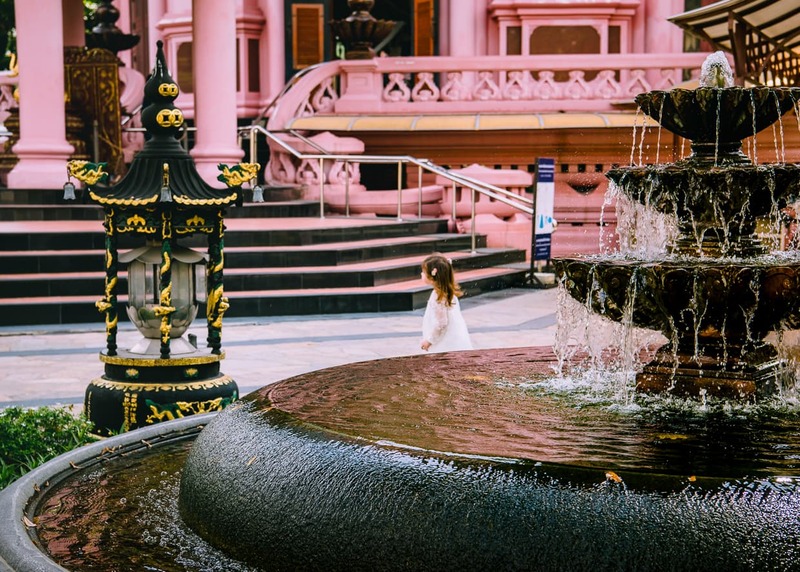 This won’t happen at the Erawan Museum. 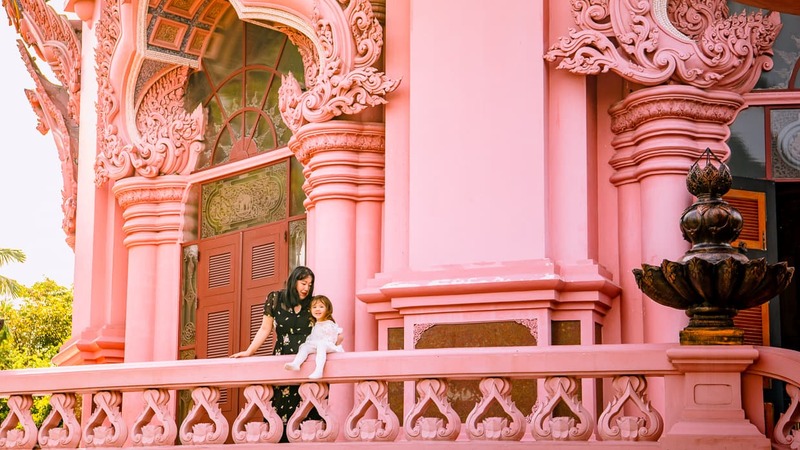 The Erawan Museum is the creation of one Kuhn Lek Viriyapant, an eccentric Thai millionaire. 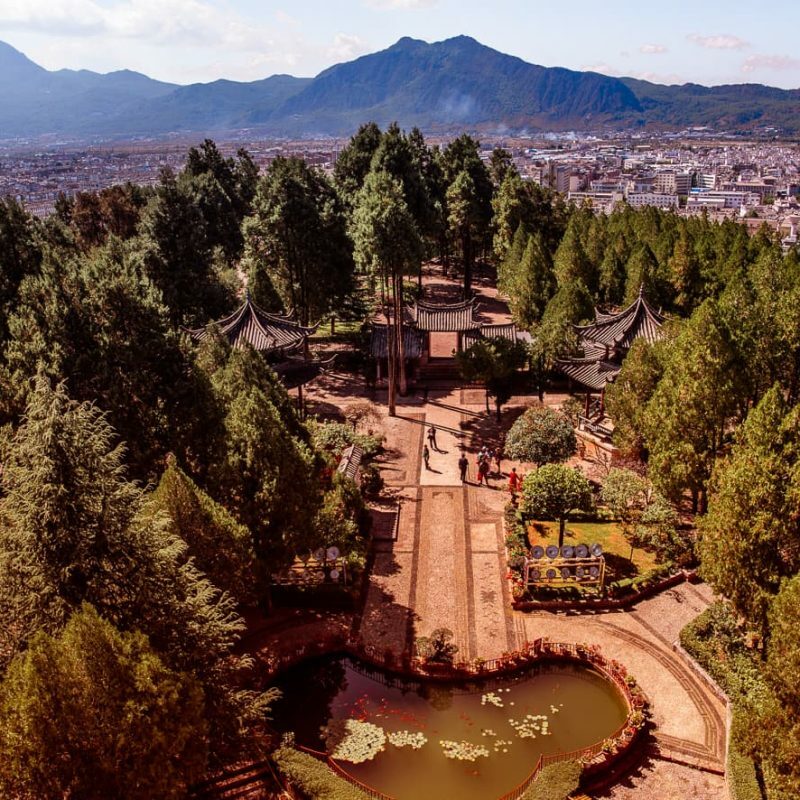 He conceived of it as a location to house his priceless collection of religious objects and antiquities but, like so many eccentric millionaires before him, he might have gone a little overboard. All I mean by this is that the museum itself kind of steals the show. 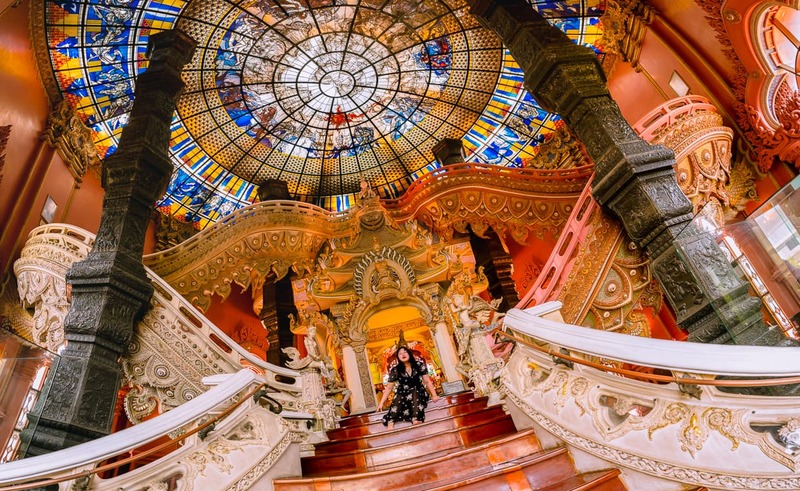 The Erawan Museum is one of three museums built by Kuhn Lek Viriyapant, and sadly the only one we have had the opportunity to visit (so far!). 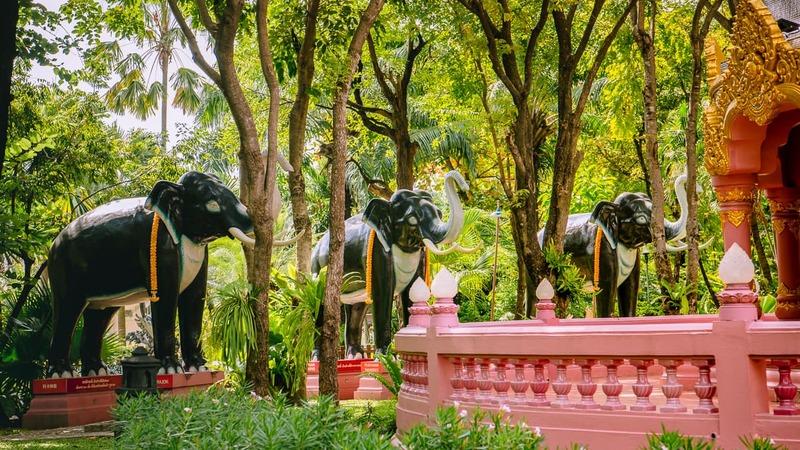 The other two are Ancient Siam (an outdoor museum shaped like a map of Thailand that was originally going to be a golf course), and the Sanctuary of Truth, an all wood monument that won’t be completed until 2050. …made of bronze weighs 250 tons, is 29 metres high, 39 metres long and stands on a 15 meter high pedestal. But those statistics are all a bit abstract and you won’t really appreciate how big it is until you see it. This three headed beast towers over the landscape, but images don’t really capture the scale very well. One reason for this is that it is so large and the the space in front of it is comparatively small, so it is difficult to capture anything else in the image to give a sense of perspective. 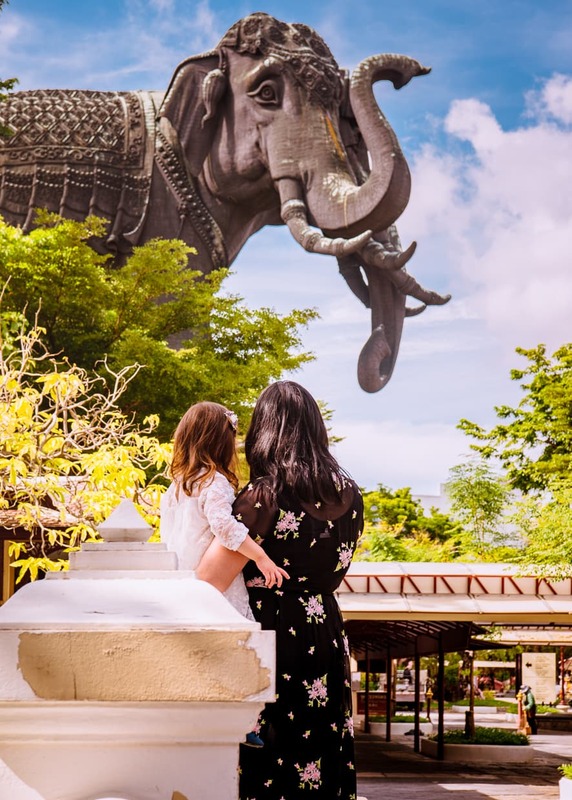 I felt like our best photo of the three headed elephant statue was from near the entrance where I took a photo of Dannie and Lisa on the footbridge with trees in the mid ground and the elephant hanging over everything. If you try to take a photo of your family in front of it from right next to the statue, you will have to lie on the ground and shoot right up everyone’s noses. Near the gift shop and restrooms, there is a stairway to a platform that is intended to give you a good view of the elephant. It does, but from here everything on the ground becomes so small that in your photos it will once again lose an obvious sense of scale. 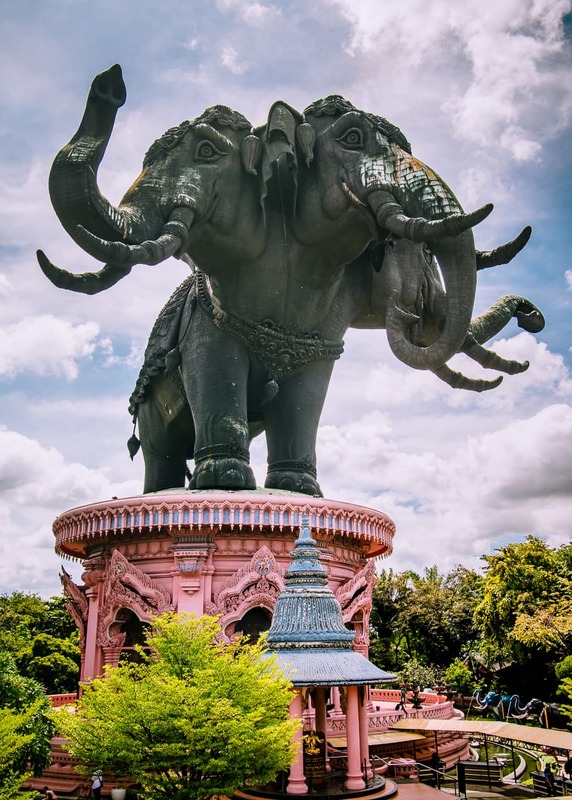 The three headed elephant statue at the Erawan Museum. 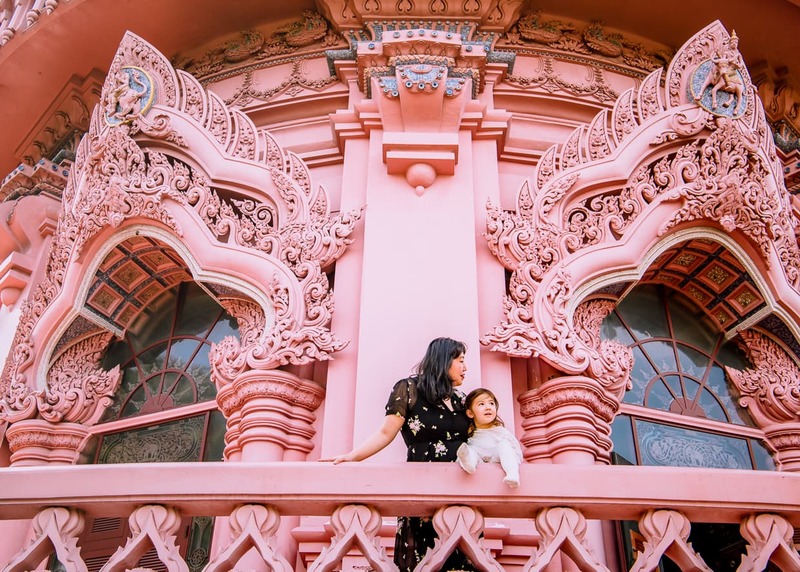 To give you an idea of how big the statue is, that bright pink platform that it’s standing on, which doesn’t look so big in pictures from a distance, is actually the three story Erawan Museum. To enter the Museum, approach the big pink pillar and take your shoes off. 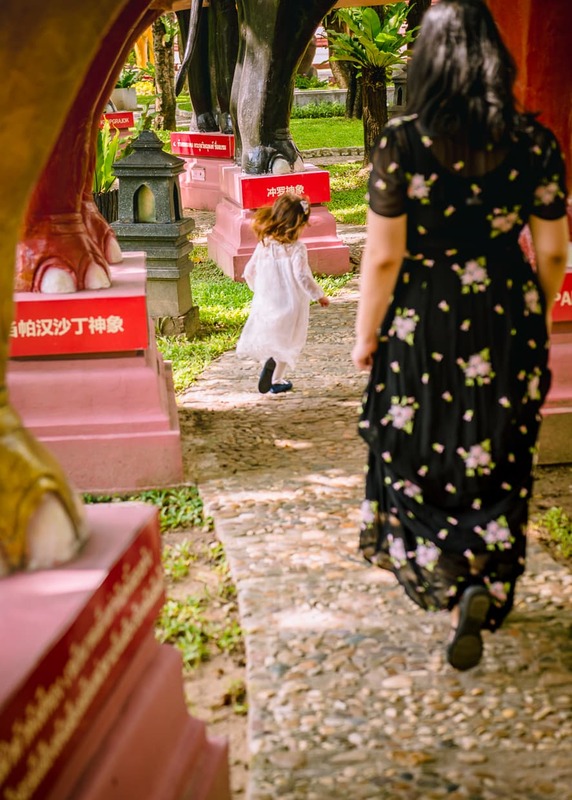 There is an area for you to place your shoes, which is provided because in addition to being a museum, the building also houses many images of Buddha and you are expected to behave accordingly. Dress modestly when you visit the museum, and don’t be noisy or obnoxious during your visit. 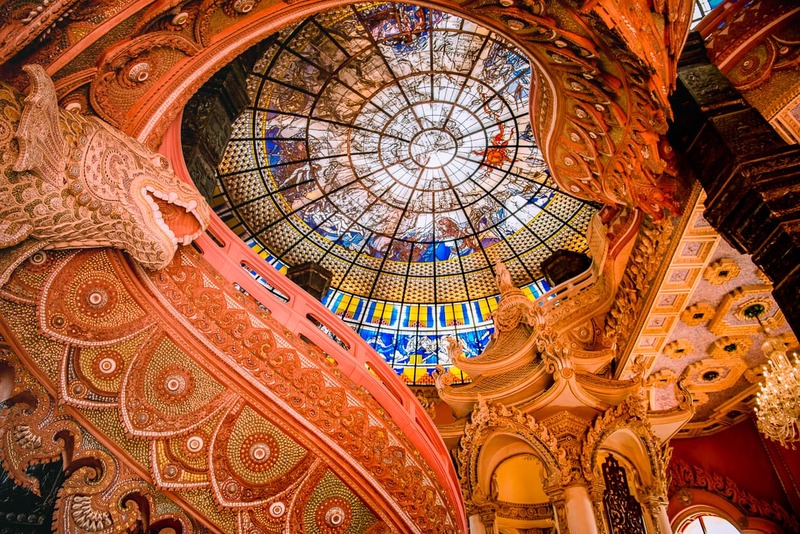 The Interior of the Erawan Museum. Possibly the prettiest view in Bangkok. As intended, the Erawan Museum does in fact house many beautiful Asian antiquities. Going from floor to floor, you will find everything from ancient Chinese vases to sculptures of Buddha and Guanyin. There is text in both Thai and English so that visitors can learn about their history and cultural value. Many of the artifacts are in the basement, where it is against the rules to take photos. Many more are on the top level. Each level of the museum represents a different plane of the Hindu representation of the universe; the Underworld, the Earth, and Heaven. On the level representing the Earth, the stairs take the form of twin serpents, winding around the room. Their white scales form the underbelly and as you climb, you walk along their backs. It’s very pretty. 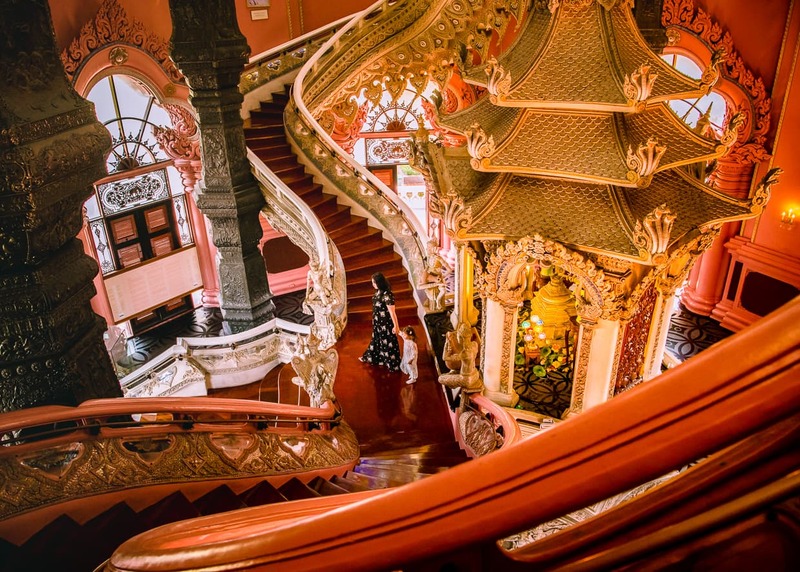 The twisting stairs of Bangkok’s Erawan Museum. Also, the Guanyin Shrine. Snake stairs. Check out the fine detail on the scales. 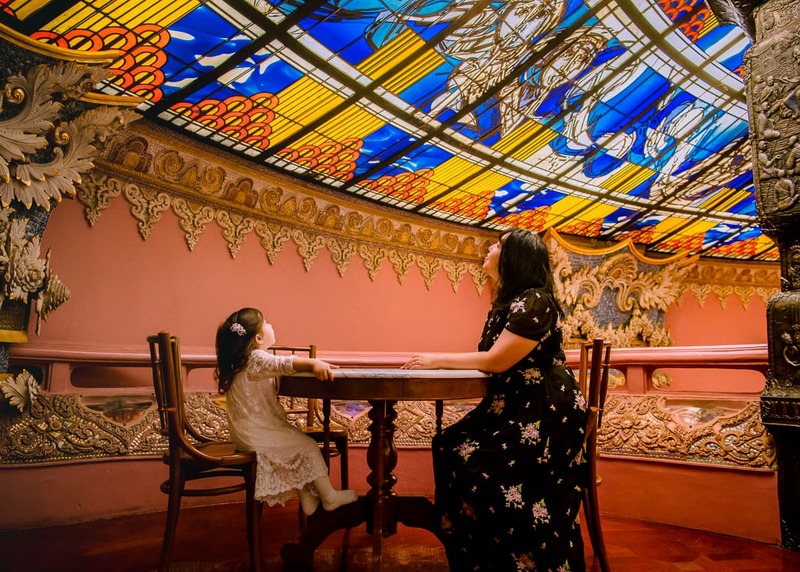 One of the centerpieces of the museum’s architecture is the enormous and colorful domed glass ceiling that covers over the “Earth” portion of the museum. The intention is that looking up will look like gazing up into the heavens through the roof of the world. It was made by German artist, Jacob Schwarzkopf. Depicted in the stained glass are the zodiac and the continents of the Earth. The colorful light that pours through this window is partially responsible for the surreal glow within the building. On the top level of the museum (which you reach by continuing to climb up a stairway into one of the elephants legs) contains many images of the Buddha, and the ceiling is a beautiful map of the universe. 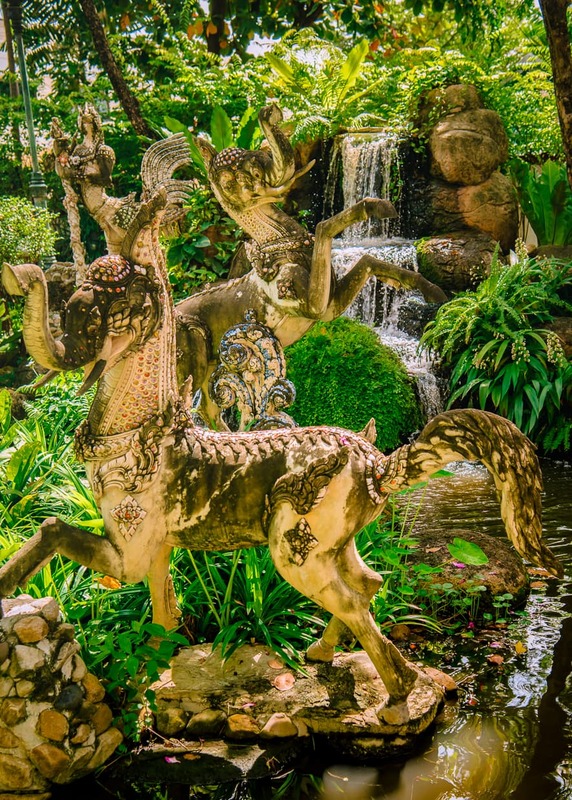 Surrounding the Erawan museum is series of beautiful gardens that can be explored. 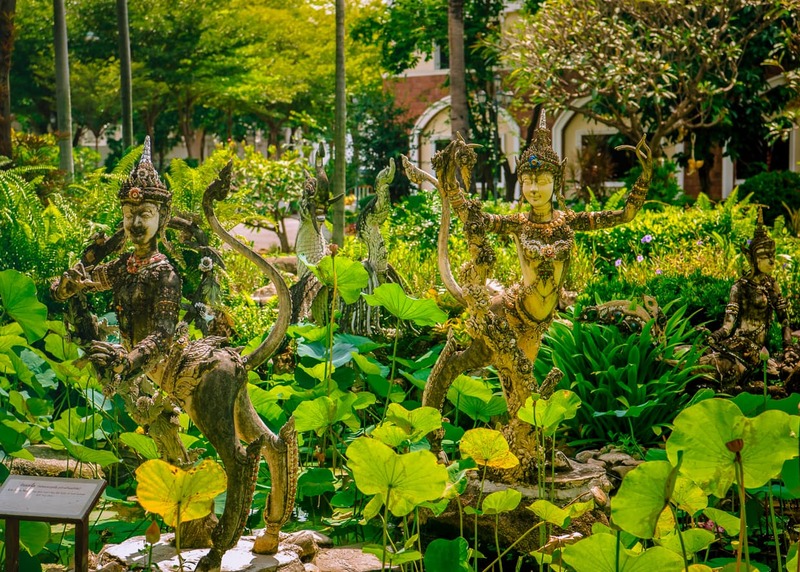 Scattered throughout the gardens, you can find all varieties of statue. 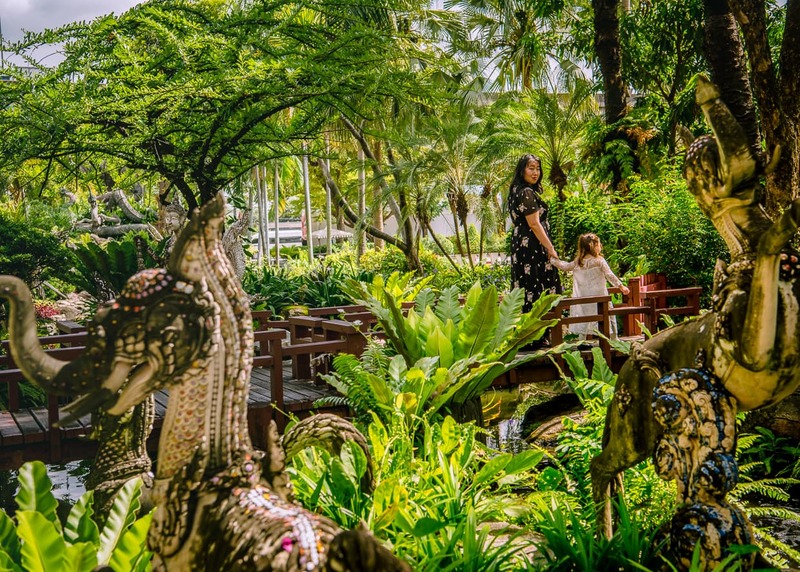 Along with images of the Buddha, there are various deities and demons that rise up from among the tropical plants and flowing waters. 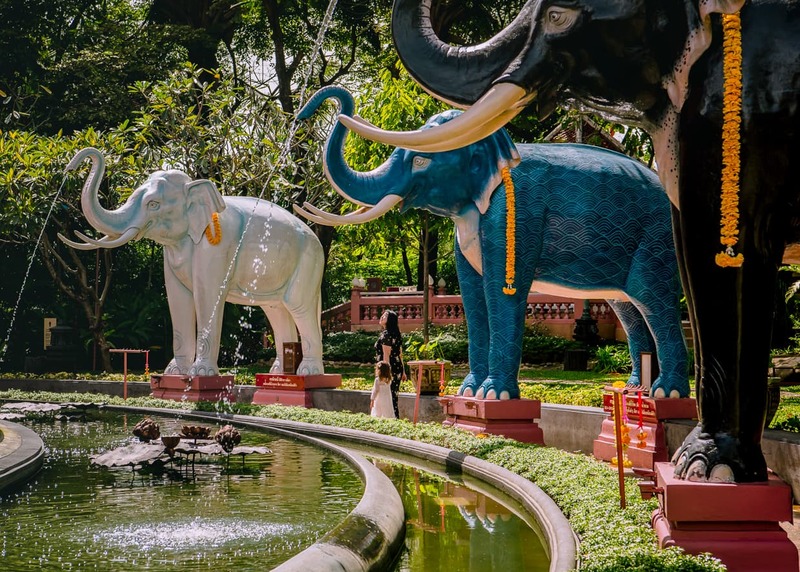 In a ring around the museum there are colorful statues of elephants. This was easily our two year old daughter Lisa’s favorite part of the complex. She loved walking between the elephants’ legs and hearing them trumpet as she passed a hidden motion sensor. There are a couple of beautiful shrines in the gardens as well. Note that these are intended to be sacred places, so make sure you take off your shoes and behave appropriately as you approach. Once you are done, you might need a break from the heat. Nothing is air conditioned as far as I can recall, but the cafe in the gift shop did have a fan and some ice cream. It was a particularly hot day when we visited, and we were relieved to sit down and enjoy something cold before we left. 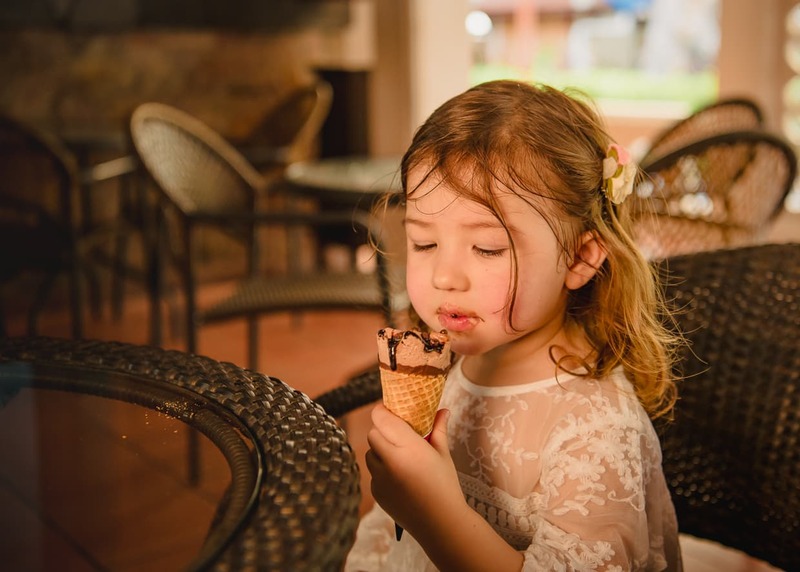 You should eat lots of ice cream in Thailand. 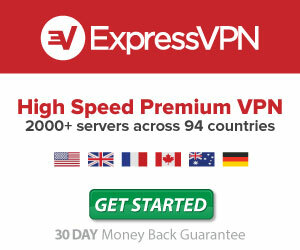 Supposedly, you can get there by taking one of the following buses: 102, 507, 511, 536. But who needs that headache. It’s too hot in Bangkok to stand around waiting for a bus. Your best bet is to take a Grab or a taxi there. We’d recommend a Grab (similar to Uber) because having the Grab app will make it easier to hail a ride when you want to return to your hotel or Airbnb. According to the museum website, there is also a shuttle that runs once a day on the weekend, but it sure doesn’t look like it gives you much time to explore. If you decide to drive yourself, or you need directions for a taxi driver, here is the Erawan Museum on Google Maps. 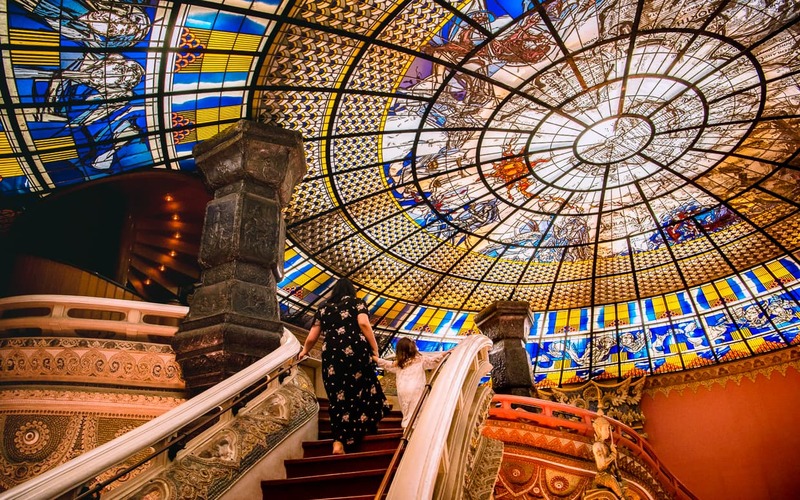 The Erawan Museum is open from 7:00 until 16:00. I have seen other times listed on other websites and on Google Maps, but this is the time that is listed on the official website. For Foreigners, tickets to the museum cost 300tbt for adults, 200tbt for children aged 6-14, and younger children are free. If you happen to be a Thai citizen, then adults can get in for 200tbt and children are 100tbt. 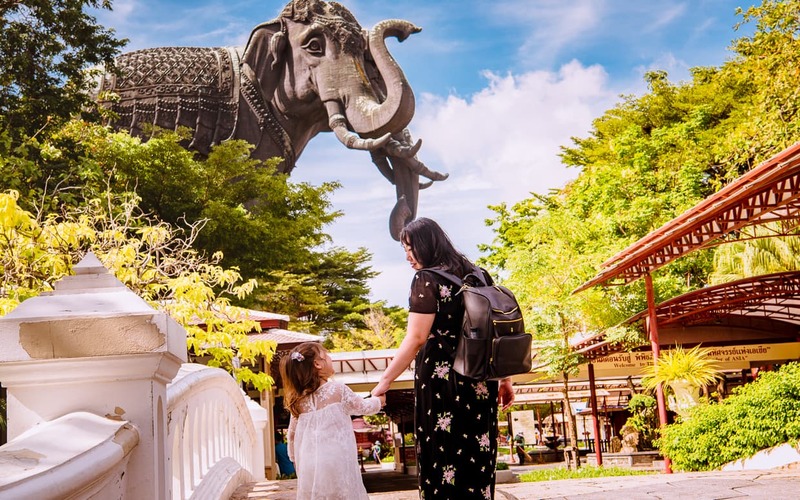 Many attractions in Thailand have different rates for citizens and foreigners. Tickets can be purchased online here, but other than possibly skipping a line (which was non-existent during our visit), I don’t see any real benefit in doing so. I would say that the best time to visit is in the morning. 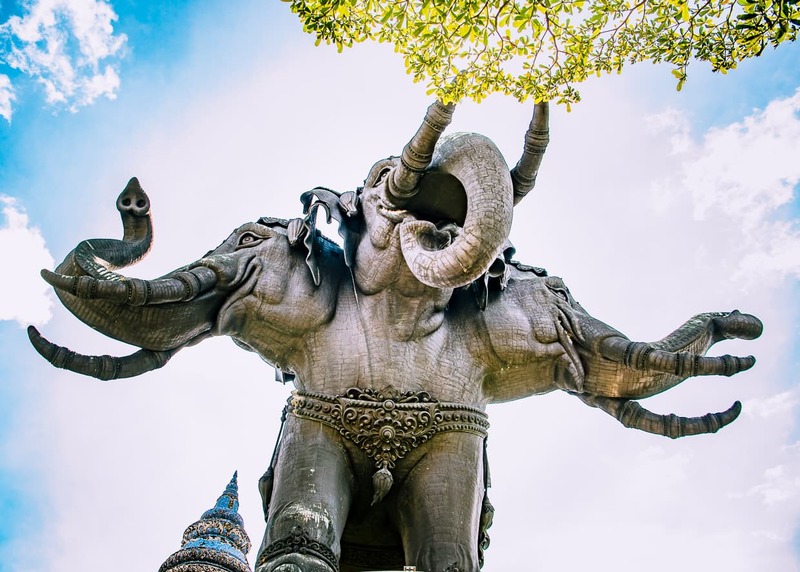 It’s Bangkok’s busiest attraction, especially compared to the Grand Palace or some of the more popular temples, but your pictures will look better if they don’t have too many people in them. We arrived right at opening, and were the first ones in. We stayed for about an hour, and it never got crowded. I know that there are tour groups that visit sometimes, so it’s definitely better to get there before that mucks everything up. Water – Honestly, you should be bringing water with you wherever you go in Bangkok, Thailand. That place is hot! 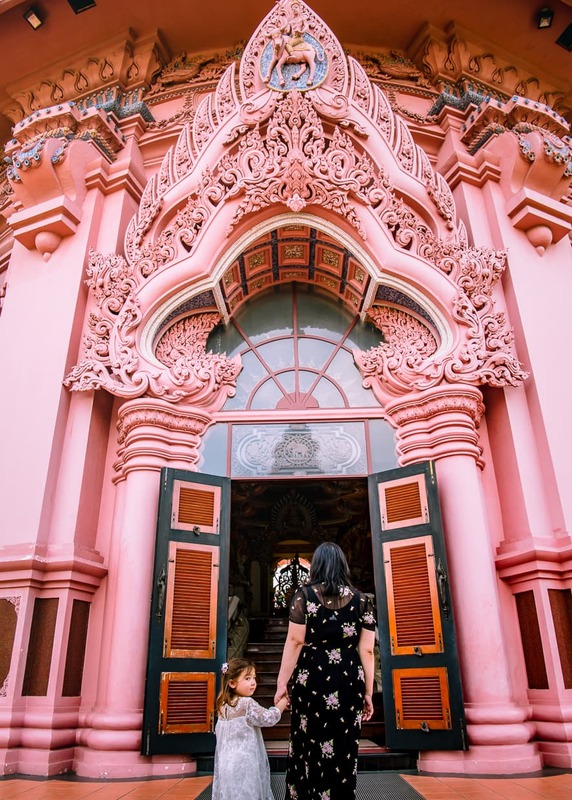 Modest Clothing – You have to follow some general temple rules when you enter the Erawan Museum, so have your shoulders and legs covered, and no cleavage. You will have to take off your shoes before entering, so if you don’t want to be barefoot, wear socks. Camera Gear – If you don’t take pictures of this place, then what are you even doing? We brought our Nikon D810 and our two favorite lenses, a 24-70mm and a 70-200mm. Honestly, though, there were a few times when I missed the ultra wide angle lens I used to carry around with me before we started traveling and I had to cut back. That elephant is big! 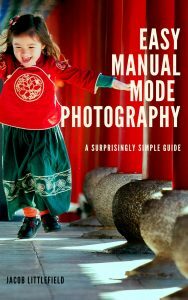 Learn to Use Your Gear – Did you know that I wrote an ebook called Easy Manual Mode Photography that could help you to get better photos out of your camera? It’s available in our shop. 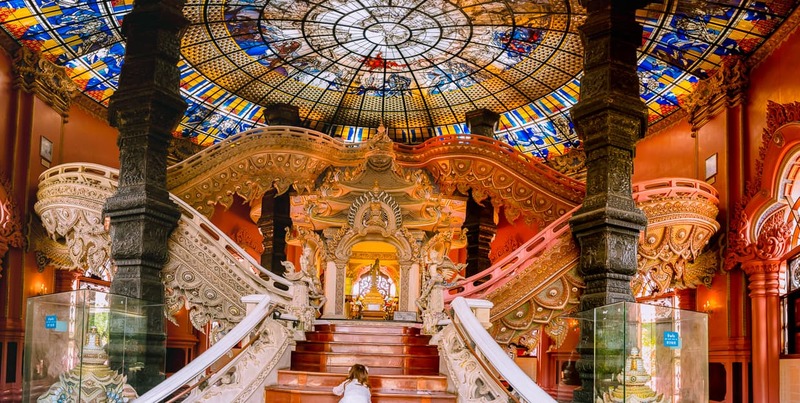 Apart from being outside the city center, there is little downside to visiting the Erawan Museum. It’s beautiful, it’s unique, it’s educational, and it’s a good break from the crowds. It even has lots of shade! 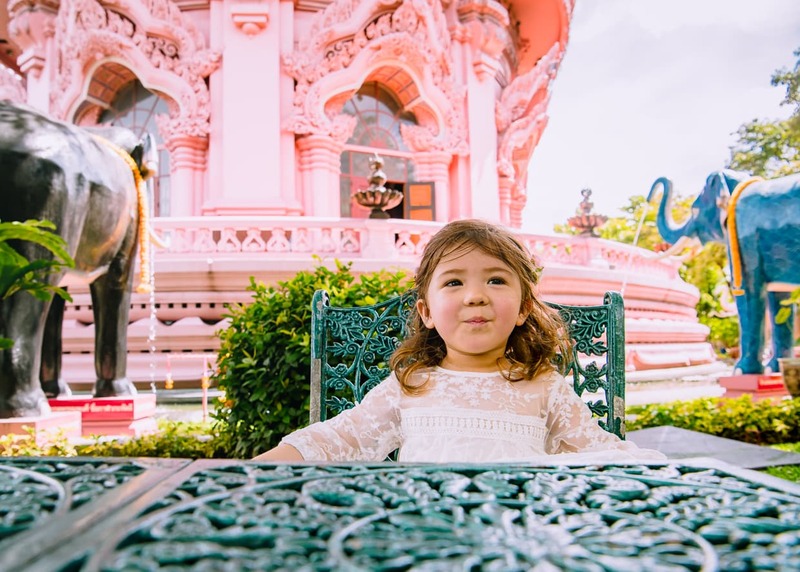 Honestly, Erawan was one of the highlights of our trip to Bangkok, and it delighted our daughter. 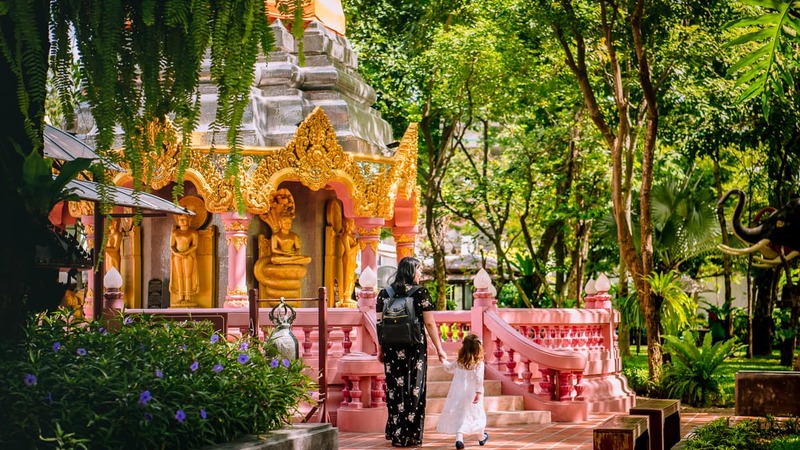 If you found this article helpful or interesting, you might want to check out some of the other content we’ve written about Bangkok, Thailand. Or just check out our destinations page to see where else we’ve been. 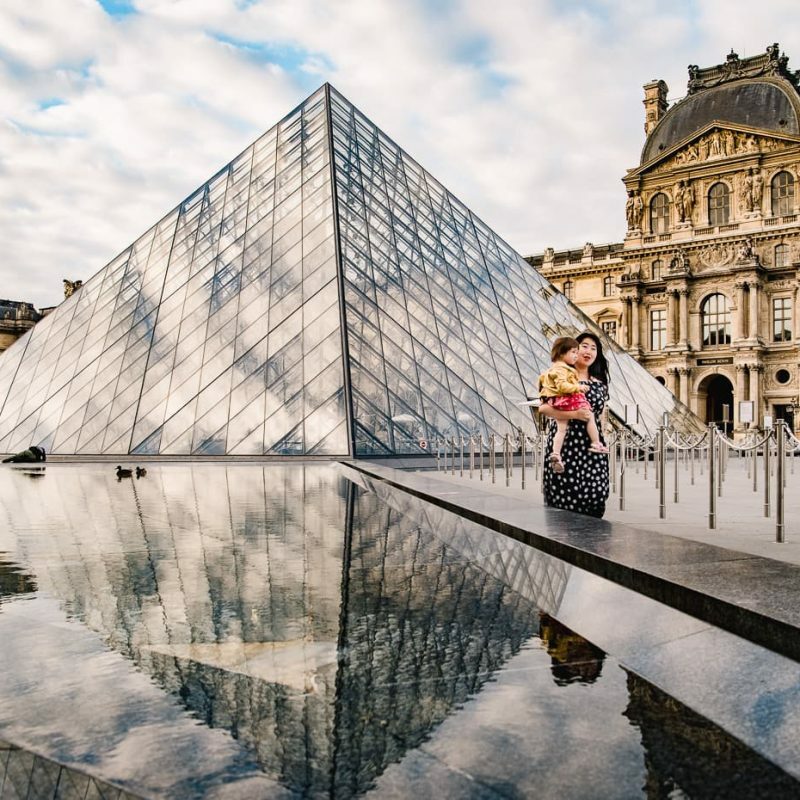 If you’d like to support us so we can bring you more content like this, you could always check out our shop and our resource page while you’re planning your next trip. 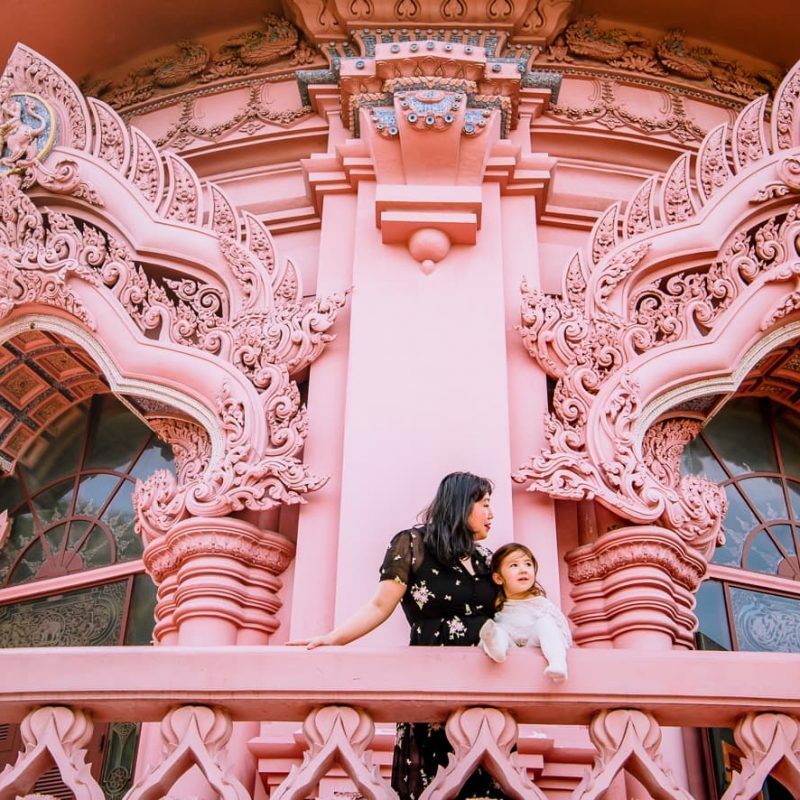 And of course, if you have any questions about visiting the Erawan Museum, head on down to the comments section and ask away. If we don’t have the answers, another reader might. Thanks for stopping by, and happy travels.